Dundalk Institute of Technology and the Oriel Traditional Orchestra are joining forces this November for a special concert at An Táin Arts Centre in Dundalk at 8pm on Wednesday 14 November 2018. Oirghialla Oscailte features traditional musicians and singers from the Department of Creative Arts, Media and Music and the Oriel Traditional Orchestra in association with the Creative Arts Research Centre. The concert is a celebration of the musical heritage of the Oriel region and marks the coming together of two pillars in the artistic community in the region, the Oriel Traditional Orchestra and Dundalk Institute of Technology. The music reflects both old and new with reference to the local and global, reminding us that music is both timeless and beyond boundaries. 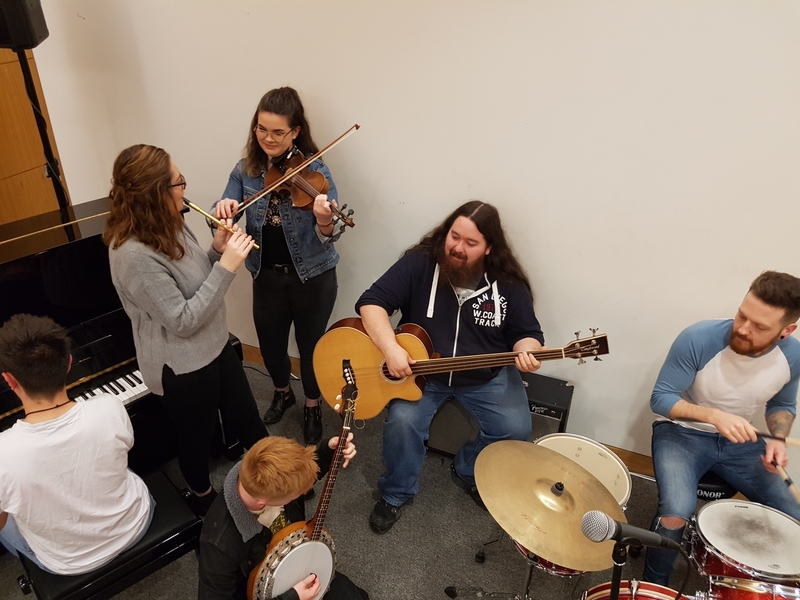 The concert marks the beginning of a collaboration supported by the Department of Culture, Heritage and the Gaeltacht who are funding an ambitious collaborative project that connects the research and expertise at DkIT with the musicians of the region. The first half of the concert features musicians from DkIT, many of whom are studying on the BA (Hons) Applied Music programme. As well as regular performances in the local area, performers and researchers from the Department of Creative Arts, Media and Music and Creative Arts Research Centre have developed a strong international profile and brought the music of Oriel to audiences globally. DkIT was the first Irish performing group to participate in the International Society for Music Education Conference when it was held in Brazil in 2014, appearing again in Glasgow in 2016, while members of the DkIT Traditional Music Ensemble performed at Speyfest again during the summer of 2018. DkIT Music researchers regularly present their research at academic conferences and other for other audiences and are delighted to collaborate with the Oriel Traditional Orchestra. The Oriel Traditional Orchestra is a cross border community orchestra whose members come from Louth, Meath, Monaghan and Armagh and focus on Irish traditional music repertoire from the region arranged especially for the orchestra. Recently appointed Ensemble in Residence at DkIT, the orchestra have performed locally in Co. Louth and in Youghal, Co. Cork, at Fleadh Cheoil na hÉireann in Drogheda and the Gerry Whelan Weekend in Cootehill, Co. Cavan. Their repertoire includes music from Meath born harper-composer Turlough O'Carolan, South Armagh fiddle player Josephine Keegan, and Louth composers Adéle Commins and Daithí Kearney. They also perform music from Brian O'Kane from Ballybay, Co. Monaghan, which he performed with the Siamsa Céilí Band from Dundalk, as well as tunes from local collections. The OTO performs repertoire from and inspired by the Oriel region with new compositions by members and local composers. To date, the repertoire has included music sourced to the Luke Donnellan collection, which formed part of Pádraigín Ní Uallacháin’s seminal study The Hidden Ulster (2003) and local fiddle player Gerry O’Connor’s MA dissertation at Dundalk Institute of Technology (2006), which was recently published as The Rose in the Gap (2018). The music of Monaghan composer Brian O’Kane, recently collected and transcribed by Dr Daithí Kearney at DkIT, is also included, as is the music of South Armagh composer Josephine Keegan, also based on research undertaken at DkIT. The orchestra has also sought to include new compositions by its members and to date this has included a set from composers and directors Daithí Kearney and Adèle Commins from their album and collection A Louth Lilt (2017) and a new set from member Philip McGuinness. As the group develops, it is planned to include some songs from the rich Oriel tradition that has been researched by Pádraigín Ní Uallacháin and some of the region’s harp music, which is currently being researched by MA student Sylvia Crawford at DkIT. The orchestra also includes arrangements of the music of Turlough O’Carolan from Nobber, Co. Meath. The developing relationship between the OTO and Centre for Creative Arts Research at DkIT highlights the shared themes and goals of the members and provides opportunity for a sharing of research, expertise, space and performances. Admission is free but contact music@dkit.ie or 042 9370280 to reserve your place.